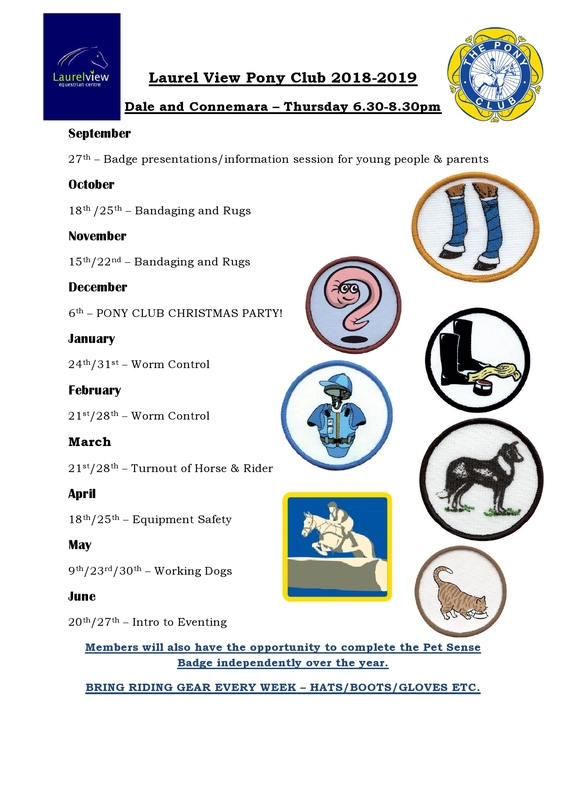 Download a copy of the 2018/2019 Pony Club Programmes, save it or print it, just so you all know what is happening & when. COST PER YOUNG PERSON – £20 PER MONTH payable on the first session of the month. Read below the long list of badges, tests and awards earned by the Laurel View Pony Clubbers over the past number of years, it’s no wonder some of the Pony Club jumpers are running out of room to sew on more badges. Well done to everyone listed. Zara Jones, Amber Kirkwood, Georgia Rea, Ashley Wray. Rebecca Braniff, Ellie Braniff, Chloe Chesney, Finn Doherty, Katelyn Evans, Aoibh Gilgunn, Holly Hamill, Holly Hanvey, Amy Lee Hanvey, Zara Jones, Ava Karolyi, Amber Kirkwood, Laura Loughlin, Sasha Mateer, Hannah Milligan, Alex Moore, Georgia Rea, Emma Sargent, Natasha Sweeney, Alara Terak, Nadine Uprichard, Ashley Wray, Evie Wright. Holly Hanvey, Amy Lee Hanvey, Sasha Mateer. Rebecca Braniff, Ellie Braniff, Chloe Chesney, Finn Doherty, Katelyn Evans, Aoibh Gilgunn, Holly Hamill, Amy Lee Hanvey, Kiera James, Zara Jones, Alice Jones, Ava Karolyi, Hannah Kernohan, Grace Kirkwood, Sasha Mateer, Lucy McDowell, Lucy McMahon Beattie, Hannah Milligan, Alex Moore, Emme Morrison, Georgia Rea, Emma Sargent, Maia Smith-Wallace, Natasha Sweeney, Sarah Williams, Stephanie Wray. Rebecca Braniff, Ellie Braniff, Chloe Chesney, Finn Doherty, Katelyn Evans, Keisha Fee, Aoibh Gilgunn, Holly Hamill, Amy Lee Hanvey, Alice Jones, Ava Karolyi, Hannah Kernohan, Grace Kirkwood, Sasha Mateer, Lucy McDowell, Hannah Milligan, Emme Morrison, Georgia Rea, Emma Sargent, Maia Smith-Wallace, Natasha Sweeney, Sarah Williams, Evie Wright. Ellie Braniff, Chloe Chesney, Zara Davis, Finn Doherty, Katelyn Evans, Keisha Fee, Aoibh Gilgunn, Holly Hamill, Amy Lee Hanvey, Kiera James, Alice Jones, Zara Jones, Ava Karolyi, Hannah Kernohan, Grace Kirkwood, Lucy McDowell, Lucy McMahon Beattie, Cassie McMaw, Hannah Milligan, Alex Moore, Emme Morrison, Georgia Rea, Emma Sargent, Sarah Williams, Stephanie Wray, Evie Wright. Ellie Braniff, Rebecca Braniff, Chloe Chesney, Zara Davis, Finn Doherty, Katelyn Evans, Keisha Fee, Aoibh Gilgunn, Holly Hamill, Amy Lee Hanvey, Kiera James, Alice Jones, Zara Jones, Ava Karolyi, Hannah Kernohan, Grace Kirkwood, Laura Loughlin, Sasha Mateer, Lucy McDowell, Cassie McMaw, Hannah Milligan, Alex Moore, Emme Morrison, Georgia Rea, Emma Sargent, Maia Smith-Wallace, Natasha Sweeney, Stephanie Wray, Evie Wright. Ellie Braniff, Rebecca Braniff, Chloe Chesney, Katelyn Evans, Keisha Fee, Aoibh Gilgunn, Holly Hamill, Amy Lee Hanvey, Ava Karolyi, Hannah Kernohan, Grace Kirkwood, Laura Loughlin, Lucy McDowell, Cassie McMaw, Hannah Milligan, Alex Moore, Emme Morrison, Georgia Rea, Emma Sargent, Natasha Sweeney, Stephanie Wray, Evie Wright, Neva Yildiz. Cassie McMaw, Hannah Milligan, Alex Moore, Emme Morrison, Sarah O’Brien, Faith Stitt-Gray, Stephanie Wray, Evie Wright. Ellie Braniff, Katelyn Evans, Holly Hamill, Amy Lee Hanvey, Alice Jones, Ava Karolyi, Hannah Kernohan, Grace Kirkwood, Laura Loughlin, Cassie McMaw, Hannah Milligan, Alex Moore, Emme Morrison, Sarah O’Brien, Faith Stitt-Gray, Natasha Sweeney, Stephanie Wray, Evie Wright. Rosee Graham, Megan Greer, Amber Kirkwood, Sasha Mateer, Erin McCrea, Lucy McMahon Beattie, Alara Terak, Nadine Uprichard, Ashley Wray. Rosee Graham, Amy Lee Hanvey, Holly Hanvey, Zara Jones, Amber Kirkwood, Sasha Mateer, Erin McCrea, Alara Terak, Ashley Wray. Rosee Graham, Amy Lee Hanvey, Holly Hanvey, Zara Jones, Amber Kirkwood, Sasha Mateer, Alara Terak, Nadine Uprichard, Ashley Wray. Chloe Chesney, Amy Lee Hanvey, Holly Hanvey, Zara Jones, Lucy McDowell, Lucy McMahon Beattie, Georgia Rea, Emma Sargent, Alara Terak, Nadine Uprichard, Ashley Wray. Luna Banasik, Ellie Braniff, Rebecca Braniff, Chloe Chesney, Finn Doherty, Jessica Douglas, Katelyn Evans, Aoibh Gilgunn, Rosee Graham, Holly Hamill, Amy Lee Hanvey, Holly Hanvey, Jazmine Hyland, Kiera James, Alice Jones, Ava Karolyi, Hannah Kernohan, Grace Kirkwood, Rebecca McNeilly, Penny McWhirter, Alex Moore, Emme Morrison, Emma Sargent, Chloe Smyth, Rebecca Smyth, Alara Terak, Nadine Uprichard, Ashley Wray, Stephanie Wray. Evie Caldwell, Connie Duncan, Amy Lee Hanvey, Sasha Mateer, Erin McCrea, Lucy McMahon Beattie, Cora McNulty, Nadine Uprichard. Ellie Braniff, Rebecca Braniff, Chloe Chesney, Finn Doherty, Jessica Douglas, Rosee Graham, Amy Lee Hanvey, Holly Hanvey, Jazmine Hyland, Alice Jones, Zara Jones, Hannah Kernohan, Amber Kirkwood, Sasha Mateer, Lucy McMahon Beattie, Rebecca McNeilly, Cally McWhirter, Penny McWhirter, Alex Moore, Emme Morrison, Emma Sargent, Chloe Smyth, Rebecca Smyth, Alara Terak, Ashley Wray, Stephanie Wray. Ellie Braniff, Rebecca Braniff, Chloe Chesney, Finn Doherty, Jessica Douglas, Rosee Graham, Holly Hamill, Amy Lee Hanvey, Holly Hanvey, Kiera James, Alice Jones, Zara Jones, Hannah Kernohan, Amber Kirkwood, Rebecca Mackey, Sasha Mateer, Rebecca McNeilly, Cally McWhirter, Alex Moore, Emme Morrison, Emma Sargent, Chloe Smyth, Rebecca Smyth, Alara Terak, Ashley Wray, Stephanie Wray. Luna Banasik, Ellie Braniff, Rebecca Braniff, Chloe Chesney, Kirsten Davis, Zara Davis, Finn Doherty, Jessica Douglas, Katelyn Evans, Rosee Graham, Holly Hamill, Amy Lee Hanvey, Holly Hanvey, Alice Jones, Zara Jones, Ava Karolyi, Hannah Kernohan, Amber Kirkwood, Grace Kirkwood, Sasha Mateer, Lucy McMahon Beattie, Rebecca McNeilly, Alex Moore, Emma Sargent, Chloe Smyth, Alara Terak, Ashley Wray, Stephanie Wray. Ellie Braniff, Rebecca Braniff, Chloe Chesney, Finn Doherty, Jessica Douglas, Rosee Graham, Holly Hanvey, Jazmine Hyland, Alice Jones, Zara Jones, Hannah Kernohan, Amber Kirkwood, Rebecca McNeilly, Cally McWhirter, Penny McWhirter, Alex Moore, Emme Morrison, Emma Sargent, Chloe Smyth, Rebecca Smyth, Alara Terak, Ashley Wray, Stephanie Wray. Ellie Braniff, Rebecca Braniff, Chloe Chesney, Kirsten Davis, Zara Davis, Finn Doherty, Jessica Douglas, Rosee Graham, Holly Hamill, Amy Lee Hanvey, Holly Hanvey, Kiera James, Alice Jones, Zara Jones, Hannah Kernohan, Amber Kirkwood, Rebecca Mackey, Sasha Mateer, Lucy McMahon Beattie, Rebecca McNeilly, Cally McWhirter, Penny McWhirter, Alex Moore, Emme Morrison, Emma Sargent, Chloe Smyth, Rebecca Smyth, Alara Terak, Ashley Wray, Stephanie Wray. Rebecca Braniff, Chloe Chesney, Kirsten Davis, Zara Davis, Finn Doherty, Jessica Douglas, Rosee Graham, Holly Hamill, Holly Hanvey, Alice Jones, Zara Jones, Hannah Kernohan, Amber Kirkwood, Rebecca McNeilly, Cally McWhirter, Penny McWhirter, Alex Moore, Emme Morrison, Emma Sargent, Chloe Smyth, Rebecca Smyth, Alara Terak, Rebecca Woodside, Ashley Wray, Stephanie Wray. Evie Caldwell, Zara Davis, Connie Duncan, Amy Lee Hanvey, Sasha Mateer, Erin McCrea, Lucy McMahon Beattie, Nadine Uprichard. Luna Banasik, Ellie Braniff, Rebecca Braniff, Evie Caldwell, Chloe Chesney, Finn Doherty, Jessica Douglas, Connie Duncan, Katelyn Evans, Aoibh Gilgunn, Rosee Graham, Holly Hamill, Amy Lee Hanvey, Holly Hanvey, Alice Jones, Zara Jones, Ava Karolyi, Hannah Kernohan, Amber Kirkwood, Grace Kirkwood, Sasha Mateer, Erin McCrea, Lucy McMahon Beattie, Rebecca McNeilly, Cora McNulty, Cally McWhirter, Alex Moore, Emme Morrison, Emma Sargent, Chloe Smyth, Alara Terak, Nadine Uprichard, Ashley Wray, Stephanie Wray. Evie Caldwell, Connie Duncan, Amy Lee Hanvey, Sasha Mateer, Erin McCrea, Cora McNulty. Evie Caldwell, Kirsten Davis, Zara Davis, Connie Duncan, Amy Lee Hanvey, Sasha Mateer, Erin McCrea, Lucy McMahon Beattie, Nadine Uprichard. Evie Caldwell, Zara Davis, Connie Duncan, Amy Lee Hanvey, Sasha Mateer, Erin McCrea, Lucy McMahon Beattie, Cora McNulty. Evie Caldwell, Kirsten Davis, Zara Davis, Connie Duncan, Amy Lee Hanvey, Sasha Mateer, Erin McCrea, Lucy McMahon Beattie, Cora McNulty, Nadine Uprichard. Connie Duncan, Lauren Ferguson, Sarah Ferguson, Grace Gillen, Megan Greer, Amber Kirkwood, Sasha Mateer, Cally McWhirter. Keeley Agnew, Ellie Braniff, Rebecca Braniff, Evie Caldwell, Finn Doherty, Jessica Douglas, Connie Duncan, Rachel Fleming, Grace Gillen, Rosee Graham, Megan Greer, Holly Hanvey, Amber Kirkwood, Sasha Mateer, Lucy McMahon Beattie, Rebecca McNeilly, Cally McWhirter, Penny McWhirter, Grace Murray, Chloe Smyth, Rebecca Smyth, Alara Terak. Keeley Agnew, Oliver Carter, Finn Doherty, Connie Duncan, Rachel Fleming, Grace Gillen, Rosee Graham, Megan Greer, Holly Hanvey, Jazmine Hyland, Erin McCrea, Cally McWhirter, Penny McWhirter, Grace Murray, Chloe Smyth, Rebecca Smyth, Alara Terak. Keeley Agnew, Evie Caldwell, Oliver Carter, Finn Doherty, Connie Duncan, Rachel Fleming, Rosee Graham, Megan Greer, Holly Hanvey, Jazmine Hyland, Amber Kirkwood, Sasha Mateer, Erin McCrea, Lucy McMahon Beattie, Cally McWhirter, Penny McWhirter, Grace Murray, Zoe Robinson, Chloe Smyth, Rebecca Smyth, Alara Terak. Keeley Agnew, Evie Caldwell, Oliver Carter, Finn Doherty, Jessica Douglas, Connie Duncan, Rachel Fleming, Grace Gillen, Rosee Graham, Megan Greer, Holly Hanvey, Alice Jones, Amber Kirkwood, Sasha Mateer, Lucy McMahon Beattie, Rebecca McNeilly, Cally McWhirter, Penny McWhirter, Grace Murray, Chloe Smyth, Rebecca Smyth, Alara Terak. Evie Caldwell, Connie Duncan, Grace Gillen, Megan Greer, Sasha Mateer, Cally McWhirter, Grace Murray. Keeley Agnew, Evie Caldwell, Finn Doherty, Jessica Douglas, Connie Duncan, Rachel Fleming, Grace Gillen, Rosee Graham, Megan Greer, Holly Hanvey, Jazmine Hyland, Amber Kirkwood, Sasha Mateer, Erin McCrea, Lucy McMahon Beattie, Rebecca McNeilly, Cally McWhirter, Penny McWhirter, Grace Murray, Chloe Smyth, Rebecca Smyth, Alara Terak. Evie Caldwell, Oliver Carter, Connie Duncan, Lauren Ferguson, Sarah Ferguson, Rachel Fleming, Grace Gillen, Jazmine Hyland, Amber Kirkwood, Sasha Mateer, Brianna McCormick, Erin McCrea, Lucy McMahon Beattie, Cally McWhirter, Penny McWhirter, Grace Murray, Paige Weir, Emily Wilson. Keeley Agnew, Evie Caldwell, Connie Duncan, Lauren Ferguson, Sarah Ferguson, Rachel Fleming, Grace Gillen, Megan Greer, Jazmine Hyland, Amber Kirkwood, Sasha Mateer, Brianna McCormick, Cally McWhirter, Penny McWhirter, Grace Murray, Chloe Smyth, Rebecca Smyth, Paige Weir. Kacey Balmer, Evie Caldwell, Oliver Carter, Rachel Fleming, Shannon Wilson. Kirsten Davis, Zara Davis, Lucy McMahon Beattie. Aimee Davis, Sophie McGuckin, Cora McNulty. Aimee Davis, Kirsten Davis, Zara Davis, Sophie McGuckin. Kacey Balmer, Oliver Carter, Hayley Doyle, Rachel Fleming, Stephanie Fox, Erin McCrea, Shannon Wilson. Charley Adams, Chloe Baxter, Aimee Davis, Kirsten Davis, Zara Davis, Sophie McGuckin, Lucy McMahon Beattie, Cora McNulty, Grace Murray, Lana Turner. Kacey Balmer, Oliver Carter, Cormac Creagh, Rachel Fleming, Stephanie Fox, Shannon Wilson. Kacey Balmer, Oliver Carter, Cormac Creagh, Erin McCrea, Shannon Wilson. Kacey Balmer, Evie Caldwell, Oliver Carter, Connie Duncan, Rachel Fleming, Grace Gillen, Cally McWhirter, Penny McWhirter, Shannon Wilson. Kacey Balmer, Evie Caldwell, Oliver Carter, Connie Duncan, Rachel Fleming, Erin McCrea, Cally McWhirter, Penny McWhirter, Shannon Wilson. Evie Caldwell, Oliver Carter, Cormac Creagh, Connie Duncan, Rachel Fleming, Grace Gillen, Katy Hall, Cally McWhirter, Penny McWhirter, Shannon Wilson. Aimee Davis, Sophie McGuckin, Lucy McMahon Beattie, Cora McNulty. Kirsten Davis, Zara Davis, Sophie McGuckin, Lucy McMahon Beattie, Cora McNulty, Grace Murray, Lana Turner. Kacey Balmer, Evie Caldwell, Oliver Carter, Cormac Creagh, Rachel Fleming, Grace Gillen, Erin McCrea, Cally McWhirter, Penny McWhirter. 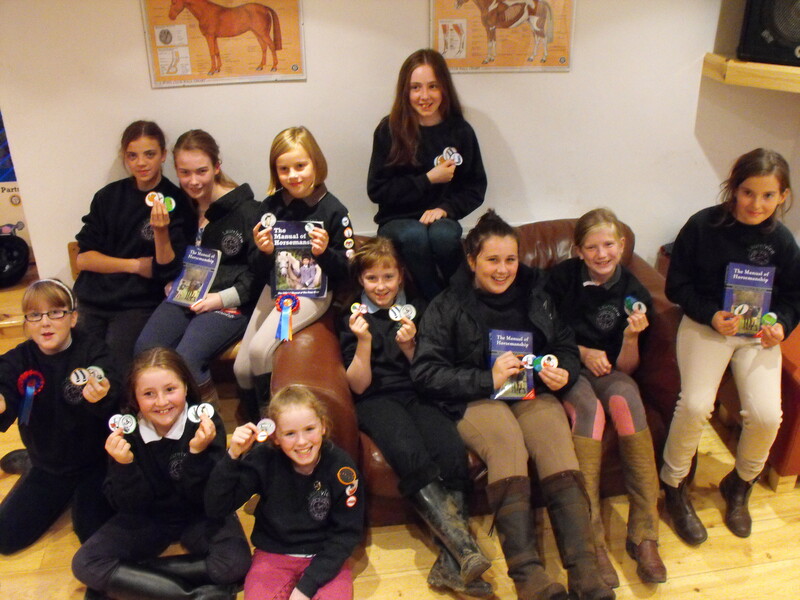 Pony Club members continued with their activities and badgework between January and June. With some of the Senior Members starting to work towards their Endurance Badge (hopefully to be completed in the Halloween hols) and both Senior and Junior Members had their own Pony Club camps in August. The first session of the new season was another awards presentation evening, but also an intro to Pony Club for new members, so it was great to see a lot of new faces to the Pony Club at Laurel View. 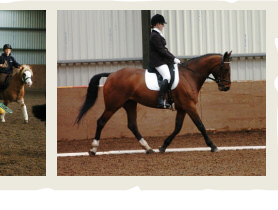 Read on to find out who has been doing what during the 2013 – 2014 Pony Club year, its quite a varied and impressive list. This Carriage Driving badge was achieved by Aimee Davis, Kirsten Davis, Zara Davis, Lauren Hill, Sophie McGuckin and Cora McNulty. Fire Marshal badges were earned by Aimee Davis, Kirsten Davis, Zara Davis, Darci Harbinson, Lauren Hill, Sophie McGuckin and Cora McNulty. Aimee Davis, Kirsten Davis, Zara Davis, Darci Harbinson, Lauren Hill, Sophie McGuckin and Cora McNulty all worked towards and achieved their Human First Aid badge. Chloe Baxter, Zara Jones, Holly McKeown and Ellie Templeton worked on their Grooming achievement badge. While Oliver Carter, Cormac Creagh, Stephanie Fox, Hannah Lusty, Erin McCrea, Rebecca Murphy, Jasmine Shields, Lauren Welsh and Luke Williamson took home the Mini Grooming Achievement badge. Now Oliver Carter, Cormac Creagh, Hayley Doyle, Stephanie Fox, Zara Jones, Hannah Lusty, Erin McCrea, Holly McKeown, Lucy McMahon-Beattie and Luke Williamson know a lot more about Perfect Paddocks. Apparently Aimee Davis, Kirsten Davis, Zara Davis, Darci Harbinson, Lauren Hill, Sophie McGuckin and Cora McNulty now all have Pet Sense. Chloe Baxter, Erin McCrea, Lucy McMahon-Beattie and Luke Williamson added Points of the Horse to their badge collection. With Cormac Creagh getting the Points of the Pony mini achievement badge. The Camping mini achievement badge was taken home by Chloe Baxter, Amy Blackbourne, Oliver Carter, Hayley Doyle, Stephanie Fox, Zara Jones, Erin McCrea, Holly McKeown, Lucy McMahon-Beattie and Luke Williamson. A Fire Safety mini achievement badge was proudly collected by Chloe Baxter, Amy Blackbourne, Oliver Carter, Cormac Creagh, Hayley Doyle, Stephanie Fox, Zara Jones, Erin McCrea, Holly McKeown, Lucy McMahon-Beattie, Ellie Templeton and Luke Williamson. 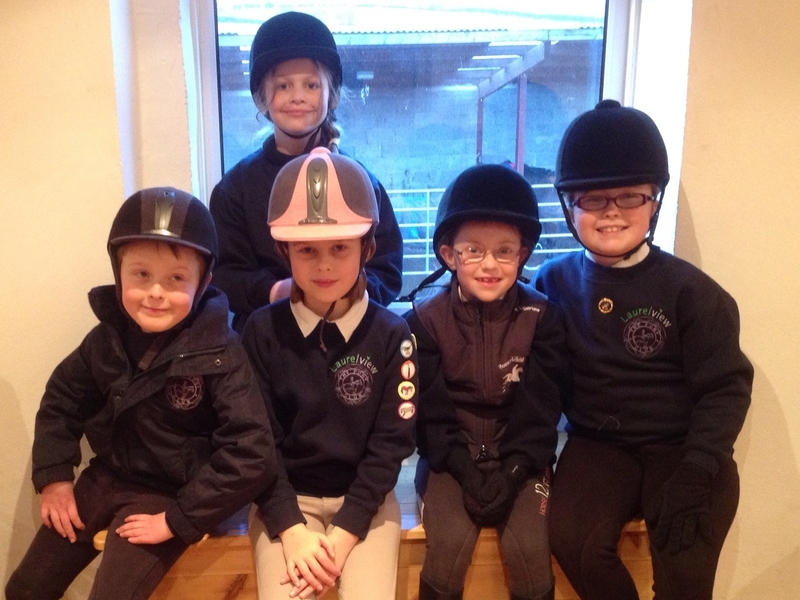 The Pony Club worked very hard during the last couple of months in 2013. All their hard work was evident when the badges were presented at a special Christmas Party and Presentations evening on 12th December. The first excitement of the evening was when Santa came to visit, giving all the pony clubbers and leaders a ride in his horse drawn carriage, before giving out pressies and listening to the updates/amendments of Christmas lists. Some games followed meaning that some of the members got a little bit messy, then it was up to the club room for nibbles. Parents were invited along for the presentations. Fundraising badges were awarded to Chloe Baxter, Oliver Carter, Aimee Davis, Kirsten Davis, Zara Davis, Hayley Doyle, Stephanie Fox, Darci Harbinson, Lauren Hill, Milo Hughes, Zara Jones, Tammie Marston, Erin McCrea, Sophie McGuckin, Holly McKeown, Lucy McMahon Beattie, Cora McNulty, Kate Spence, Ellie Templeton, Luke Williamson and Kiri Woodward. Building Show Jumps badges were presented to Aimee Davis, Kirsten Davis, Zara Davis, Darci Harbinson, Lauren Hill, Sophie McGuckin, Cora McNulty and Kate Spence. Working Dogs badges were awarded to Zara Jones and Holly McKeown with Mini Achievment badges going to Chloe Baxter, Oliver Carter, Erin Connor, Stephanie Fox, Tammie Marston, Erin McCrea, Lucy McMahon Beattie, Ellie Templeton, Luke Williamson and Kiri Woodward. Rider Nutrition badges were earned by Aimee Davis, Kirsten Davis, Zara Davis, Darci Harbinson, Lauren Hill, Sophie McGuckin, Cora McNulty and Kate Spence. Native badges were added to the collection for Chloe Baxter, Cormac Creagh, Erin McCrea, Holly McKeown, Lucy McMahon Beattie, Ellie Templeton and Luke Williamson. 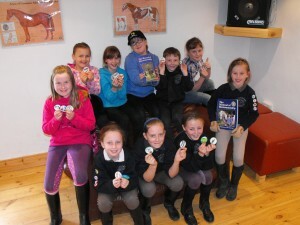 Mini Achievement Badges for Pet Sense were taken home by Chloe Baxter, Oliver Carter, Stephanie Fox, Zara Jones, Tammie Marston, Erin McCrea, Holly McKeown, Lucy McMahon Beattie, Ellie Templeton, Luke Williamson and Kiri Woodward. Everyone was justifiably proud of the Pony Club Members achievements, none more than Pony Club leaders Claire Dillon and Diane Jones. We had some other special guests along on the Presentation evening to receive cheques from the money raised by the members when they were doing their fundraising badge. The representative from Guide Dogs for the Blind very gratefully accepted a cheque for £280 and told all present how this money would be put to very good use. A second even bigger cheque for £400 (raised by the larger in number Saturday group) was presented to the Jonjo Bright Trust. Local rider Jonjo’s father told the Pony Club how overwhelmed he would be with the efforts that went in to raising this cheque to aid in his rehabilitation after a horse riding accident had left him paralysed from the neck down earlier in the year. These cheque presentations illustrated just how beneficial this particular badge had been, while educating the children on fundraising skills, they also had a lot of fun, baking and selling buns, organising and competing in the Chase me Charlie competition and making up quizzes to tease their family and friends and through doing all this they raised a lot of funds for these very worthwhile causes. Members met regularly between January and June 2013, working on a variety of different badges and activities. Aimee, Kirsten & Zara Davis; Gemma Ferguson; Darci Harbinson; Lauren Hill; Sophie McGuckin and Cora McNulty. Kirsten and Zara Davis; Darci Harbinson; Lauren Hill and Cora McNulty. Kirsten and Zara Davis; Darci Harbinson; Lauren Hill ; Holly McKeown; Lucy McMahon Beattie; Cora McNulty and Kate Spence. Aimee, Kirsten and Zara Davis; Darci Harbinson; Lauren Hill and Cora McNulty. Oliver Carter; Cormac Creagh; Kirsten and Zara Davis; Zara Jones; Georgia McCann; Erin McCrea; Holly McKeown; Lucy McMahon Beattie and Kirsty Wallace. Oliver Carter; Zara Jones; Georgia and Jed McCann and Erin McCrea. Hopefully all our Pony Clubbers are very proud of their achievements, they worked very hard to earn their position on this honours list. L-R Jed McCann, Erin McCready, Zara Jones, Tori O’Hara & Cerys McGinty. Well done, now what next? On Saturday 6th October the Saturday group learnt about the correct way to feed a horse a tasty treat and they really enjoyed practicing this as you can see from the photo below. Pony Club members have made a great start to the new season, the Thursday night group had an excellent session with Farrier Joe Traynor on Thursday 27th September, with more than the pony club kids giving Joe a grilling on the shoeing process and the farriers role. We didn’t manage to take any photos as everyone was so engrossed we forgot. Biscuits and juice also went untouched that evening!! 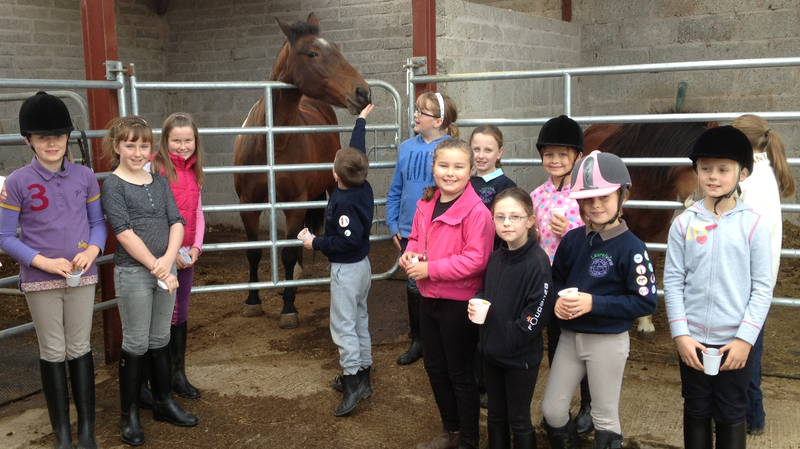 The Laurel View Pony Club Centre opened for a new term on 20th September. 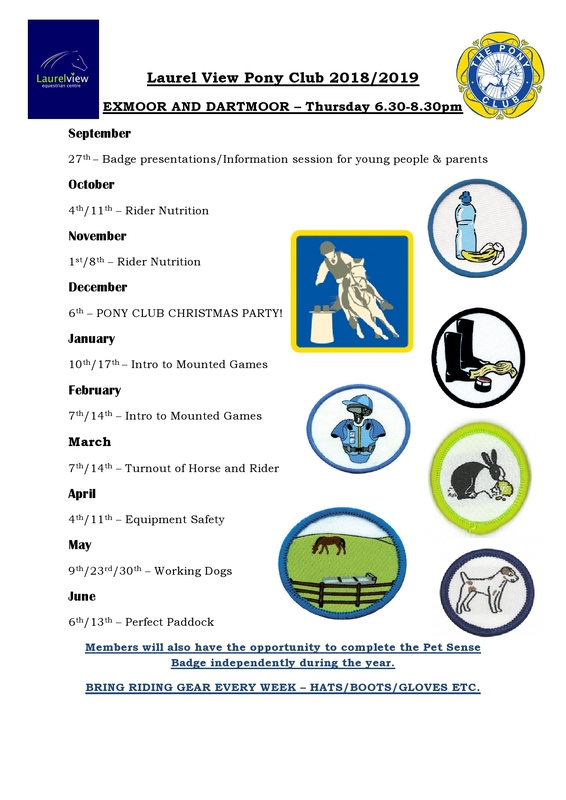 For the incoming season we are trialling a different format for the Pony Club meetings. 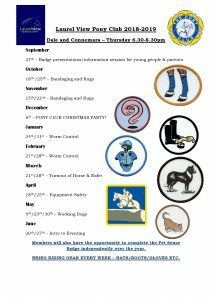 With meetings every Thursday (alternating between Blue Cross Badgework and preparation for D and D+ tests) and another session fortnightly on Saturday afternoons, working more on badgework and gearing the Pony clubbers up for the E and D tests. The opening night saw members receiving badges attained last season for Bandaging and Rugs; Dressage Arena; Flags of Equestrian Nations; Handling and Grooming; Loading; Mucking Out; Perfect Paddock; Points of the Horse; Poisonous Plants; Tack Cleaning and Wildlife. They definitely have been busy with all of wide and varied topics covered. 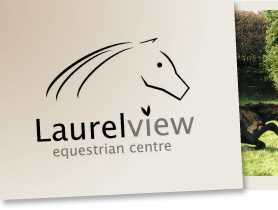 The Pony Club is open to all children who ride regularly in the Laurel View Riding School. Application forms can be picked up in the office. If you were a member and it has it run out, don’t worry it can be easily renewed by telephoning the Pony Club 024 7669 8300. 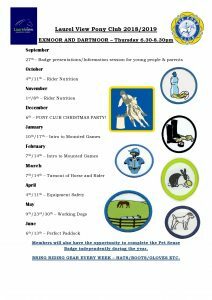 You need to be a current member to be able to participate in pony activities and work towards badges and awards. 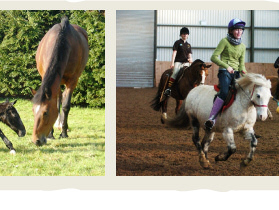 What is Pony Club Centre Membership?